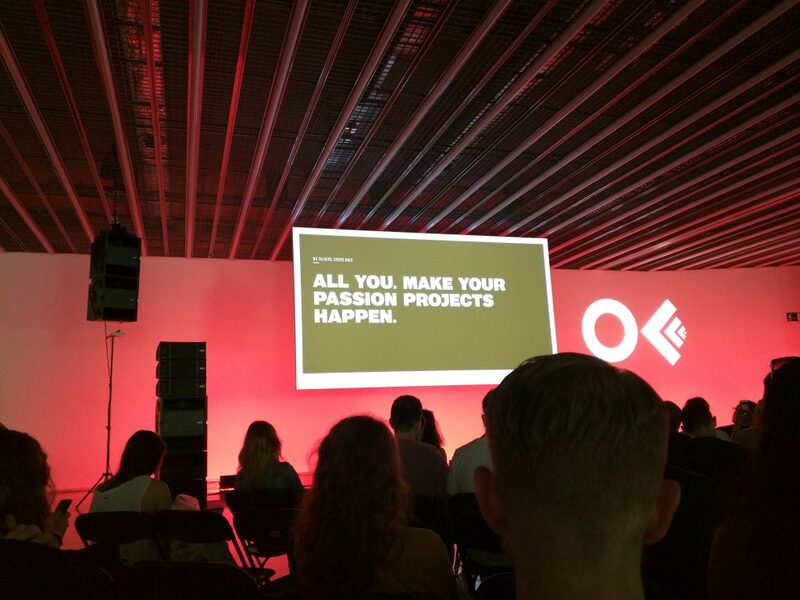 So we’ve been back from OFFF in Barcelona for nearly a month and we’re still feeling all the positive effects of it. So here are some of our highlights from the whole OFFF experience this year (and one general thing that it always delivers on). Adobe usually show off something pretty decent at OFFF and this years talk featured Dan Mumford. It was great to see the process behind his incredibly detailed work and get a look at just how complex they can be. Rounding out the first day were two incredible talks from Paula Scher and The Mill. Each featured very different works but showed a great insight into the smaller details behind those works. Paula’s talk showed some of the great strategies behind the Shakespeare in the Park work and how it evolves with the current seasons programme. Day two kicked off with a bang with an incredible talk from Sid Lee. Their approach to work and the idea behind the Sid Lee collective was refreshing. One of the biggest takeaways from any of the talks this year for us was from Sid Lee, ‘Make your passion projects happen’. A sentiment that really hit home. Day two continued as it started with the likes of UNIT9 and Non-Format, who recently did TDJ supporter Computer Arts amazing 20th anniversary cover. The last two talks of day two were from two of the best speakers to have graced the OFFF stage. First up was James White (SignalNoise), who we had the please of hanging out with this year, and who brought another fresh take on his career as well as some new pieces. I’ve seen James talk a number of times now and each time there is something new and pieces I missed the last time, certainly is like a jam packed 80’s action movie! 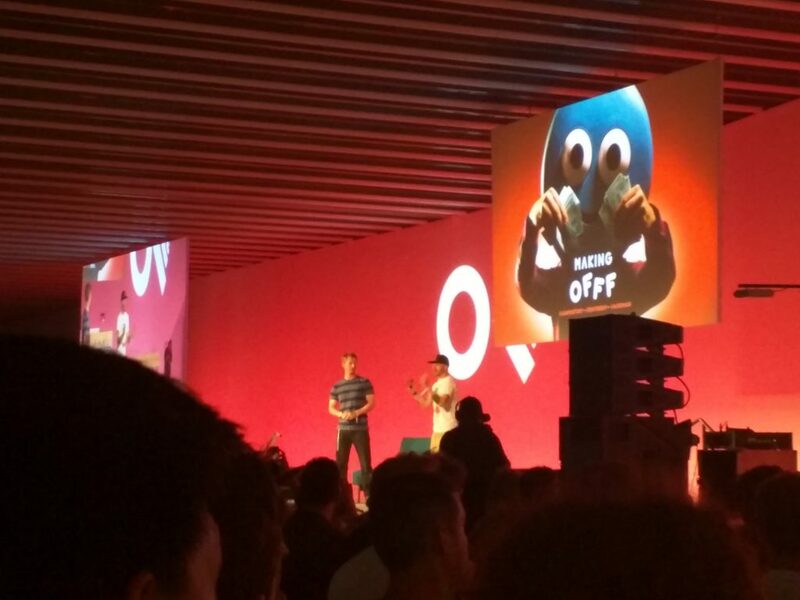 To finish the day the godfather of OFFF, Joshua Davis, brought a live show to the stage. He was joined by MIA’s drummer Kiran Gandhi (Madame Gandhi) and got the entire place on their feet with a mix of psychedelic visuals and insane drum skills. The last day of OFFF 2016 started with Tony Brook from Spin who talked all things Unit Editions as well as what he has been up to at Spin. There was even a reveal of the new Ministry of Sound identity which got a great reaction from the crowd. As the day progressed we were treated to a roller coaster of a talk from Johnny Cupcakes who let us in on some of the secrets of the success of his brand, something that has come from a lot of hard work and passion for everything he does. He was followed by non other than Mr Bingo. It was brilliant to see how much effort he put into his kickstarter for Hate Mail: The Book and also to hear what he is doing next (now). He is travelling the UK for a few weeks in a caravan… what stories will he have to tell from that journey! This was then followed by another of our highlights, Golden Wolf. This was a talk packed to the brim with awe inspiring work and positive vibes. 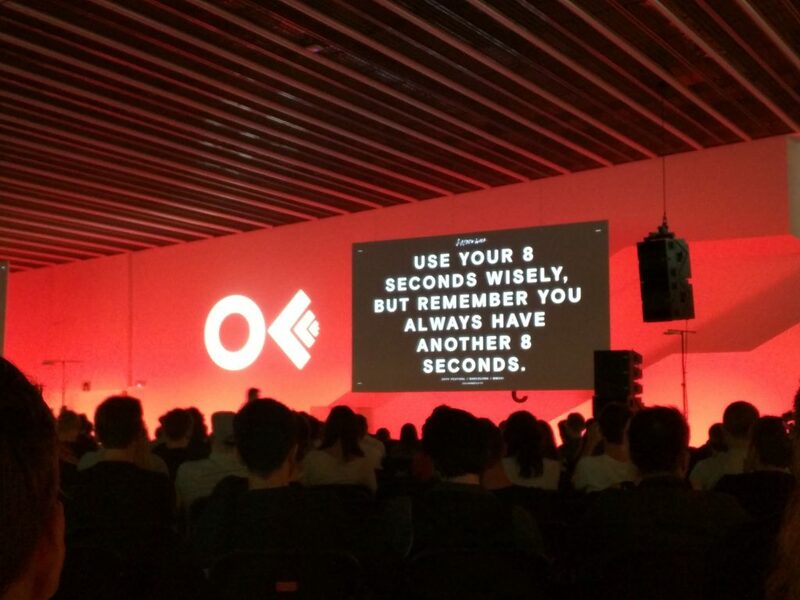 The best quote from this talk was ‘Use your 8 seconds wisely, but remember you always have another 8 seconds’. Moving on to the final talks for 2016 and the moment people had been waiting for. The titles! OFFF titles are usually an incredible masterpiece and leave the audience wanting to watch over and over. This year, TDJ guest Gaving Strange and his aardman buddy Merlin had the honours of creating the titles. If you have ever met Gav then you know what he will deliver will not only be brilliant but will have so much energy and fun to it too. The titles featured the rap skills of P.O.S., a Minneapolis, Minnesota. who proceeded to rap the entire speaker lineup for this year. The titles, which you can see below, start of muted but burst into colour with the introduction of the OFFF dude, a little, blue, hockey puck like figure with legs who conveys so much. Hearing the process of these titles from the past year and all the tiny details that really set it off you can see why Gavin, Merlin and the rest of the Aardman crew are at the top of their game. The final highlight of OFFF this year, and every other year for that matter, is the atmosphere. Every year I have been to OFFF i’ve not only walked away inspired but with so many new friends and motivation. It’s such an easy conference to convert those online relationships into real life as well as just bumping into people. 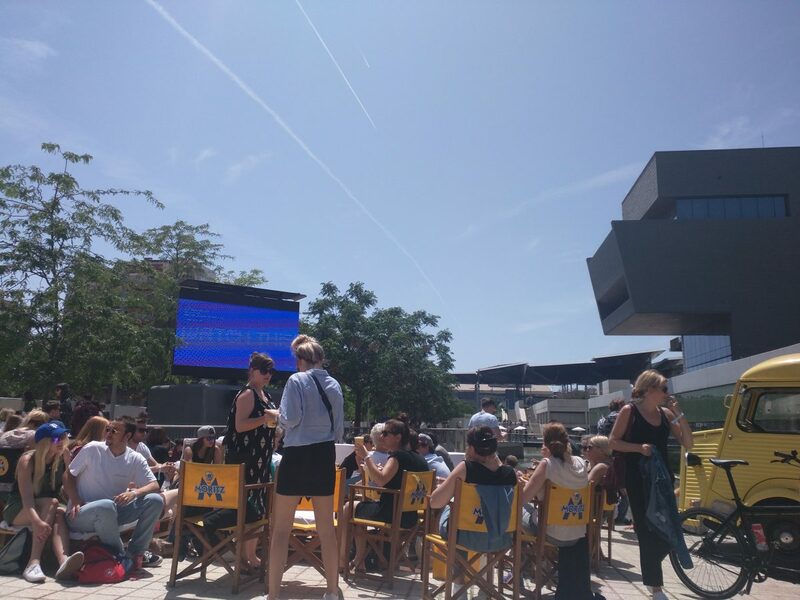 The addition of an outside food area last year added further to the experience and this years addition of an outside screen was brilliant, being able to enjoy the sun, a cold drink and good food whilst watching the talks.